Disease (SCD) or Trait (SCT)? SCD is a genetic condition that is present at birth having been inherited from one or both of their parents. 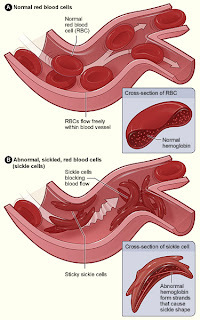 Persons who have inherited one sickle cell gene and one normal gene have SCT. This means the person won’t have the disease, but will be a trait “carrier” and can pass it onto their children. Sickle cell trait is not a type of sickle cell disease. People with sickle cell trait are generally healthy. Persons with SCD can pass either SCD or sickle cell trait (SCT) onto their children. SCT affects 1 in 12 African Americans in this country. Estimates are that 3 million people in the United States have SCT and many are unaware of the condition. SCT is also frequently found in people living in or have families in South and Central Americans, Caribbean, India, Arabia and Mediterranean counties such as Turkey Greece and Italy. A simple blood test is used to detect SCT. For several decades now blood testing for sickle cell and other blood conditions has been standard on newborns. Families with inherited SCD and SCT tendencies should see a genetic counselor (contact your family physician or local hospital) to investigate the number of relatives on the husband’s and wife’s side of the family who are carriers before deciding on having children of their own. Knowledge of medical problems possibly associated with sickle cell trait and their appropriate management is good clinical practice for athletic programs so check with the school physician and/or the athlete's physician.